1897 marks the year that Ballarat came into being. The main mine was the Radcliffe which produced 15,000 tons of gold ore between the years 1898-1903. The town was named after an Australian gold camp and was home to 400 people in 1898. 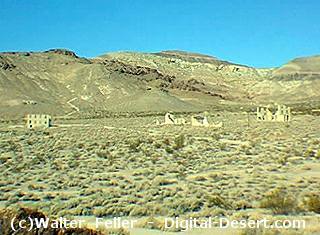 Several legendary Death Valley figures lived there. 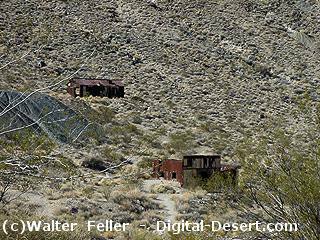 Chloride City became a town in 1905 when the Bullfrog strike brought people into the area to rework old mining claims. It became a ghost town the following year. There are numerous adits and dumps in the area and one grave of a James McKay, of whom nothing is known. This town was built around a copper strike in 1905. Water had to be hauled into town and was sold for $15 a barrel. 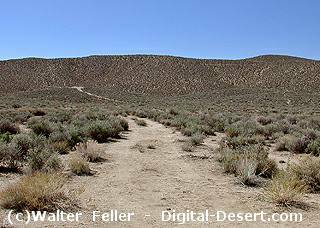 The town grew to a population of 2,000 and was known for its lively magazine the Death Valley Chuckwalla. By 1909 the mining had collapsed without ever showing a profit and people left for other areas. Originally this town was to named Harrisberry after the two men who found the gold that launched it in 1905. Shorty Harris later took credit for the strike and changed the name of the town to Harrisburg after himself. Nevertheless, Pete Aguereberry, one of the original strike finders, spent 40 years working his claims in the Eureka gold mine. Harrisburg was a tent city that grew to a population of 300. Copper and lead claims had been filed in the area as early as 1905 but it wasn't until 1906 that the area was heavily mined. In February, Charles Julian, the flamboyant promoter became president of the town's leading mining company, the Western Lead Mines. Julian's promotions were responsible for bringing great numbers of people into the area and in April, 1926 the town was laid out. Two things contributed to the demise of the town in 1927. One was the financial downfall of Charles Julian and the other was the playing-out of lead ore. It was called the toughest, rawest, most hard-boiled little hell hole that ever passed for a civilized town. Its founders were outlaws who when hiding from the law, found silver in Surprise Canyon in 1873 and gave up their life of crime. In 1874 the town was in the height of its boom with a population of 2,000. By the fall of 1875 the boom was over and in 1876 a flash flood destroyed most of the town. 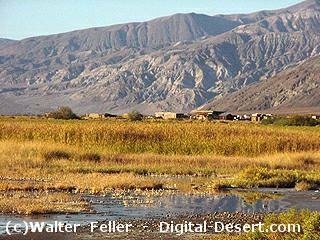 This was the biggest town in the Death Valley area boasting a population between 5,000-10,000 people. During its heyday from 1905-1911 it contained 2 churches, 50 saloons, 18 stores, 2 undertakers, 19 lodging houses, 8 doctors, 2 dentists, a stock exchange and an opera. This town was founded in 1906 by two prospectors on their way to the strike at Harrisburg. They camped in the fog and when the sun came out the next morning they awoke to a ledge of gold. The town reached a population of 700 and became famous as the site of the only hanging to take place in Death Valley.